Let’s Marvin Gaye and get it on. This has absolutely nothing to do with Marvin Gaye or getting it on. I just can’t stop singing it in my head. Especially when things are going well. Since returning from my “research trip” to the Caribbean I’ve struggled to get going again. So much so that I haven’t felt like blogging or doing anything creative. Things have gone well today, however, so here I am. It’s a funny old thing this creative process. It’s almost always a solitary activity, even if others are around in a shared studio. If something works it spurs you on, if things go wrong it can put the brakes on. And then how do you get going again? You have to struggle through it as I have in the past 10 days and try to do something, until a small glimmer of hope emerges as it has today for me. I didn’t want to get up this morning having another day of failed attempts ahead of me – and then, before I threw back the bed covers, I had a thought which has become the solution to the problem I was having. 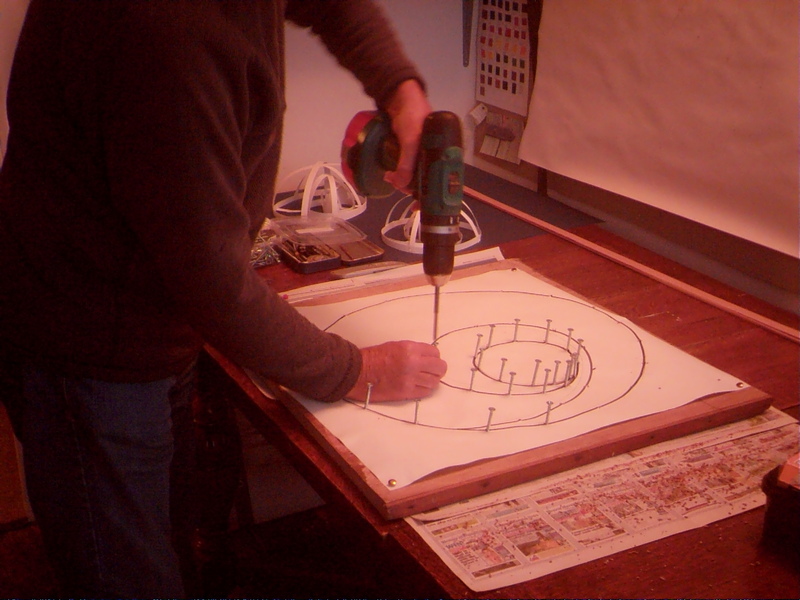 I’m working on Sculpture number 5 which is based on the form and construction of a coracle. There is an Ironbridge style coracle in the museum which has an attractive oval shape with geometric patterns of stringers and ribs. OK, but I’m not going to make a coracle – obviously. Then I thought – a boat is merely a shell – strong enough to hold a person and shaped to keep the water out. 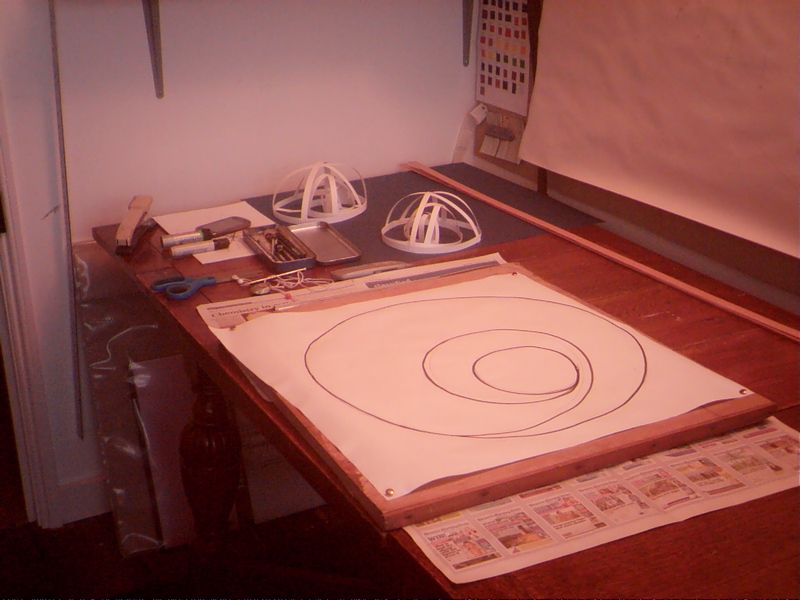 So my sculpture will be shell-like with a spiral centre, but constructed like a simple coracle. It was the spiral centre with its tight curve that has given me the most problems. Using the ash or hazel strips of wood which form the frame of a coracle would not allow me to curl round the centre of the “shell”. So I have been experimenting with thin strips of Douglas fir with a view to laminating these into place. I soaked the wood strips in boiling water for ten minutes, then wrapped them round an old paint tin. Quite often they would break in a number of places at this stage. 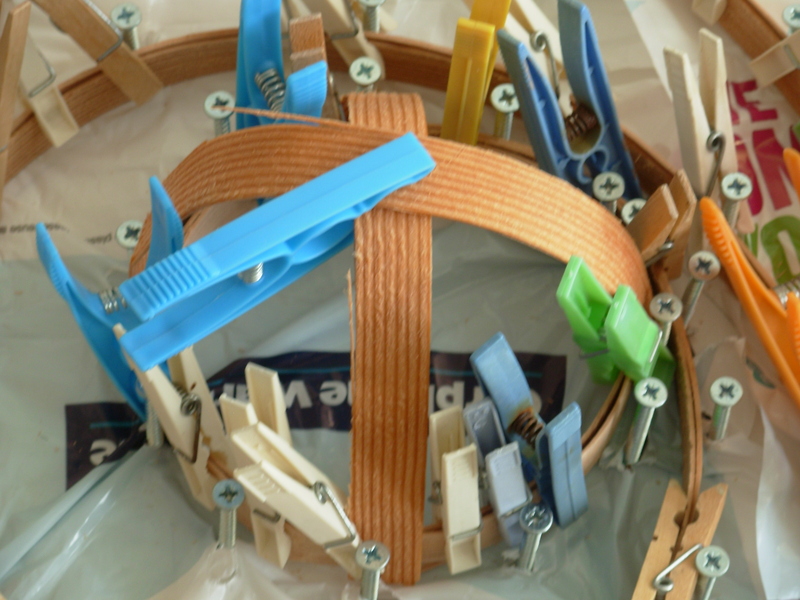 I glued the double strip together this morning. So far so good but I’m not going to use this method of construction because I can’t get the flexibility in the wood that I want. I should really be steaming the wood in a steam box and the wood ought to be green, ie not dried or seasoned as mine was. But even then I decided I could not get the curve I needed. I woke up this morning and remembered a half formed idea I had a few days ago. 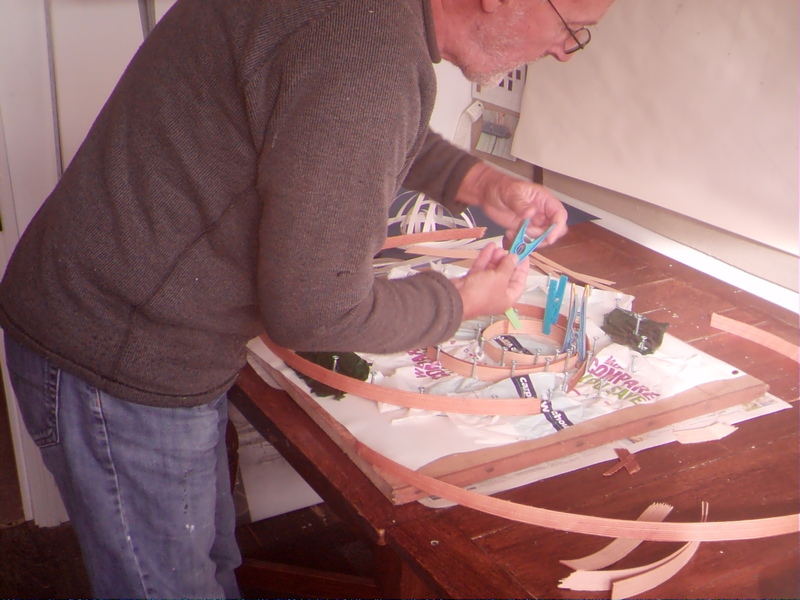 I have been using a thin birch-faced plywood for another sculpture and when I transported it in my car it was rolled up into a tube about 12 inches wide. Its only 1.5 mm thick and in one direction at least it rolls tightly up like a sheet of thin plastic. So today I have been cutting a new 5 ft square sheet into strips ready to laminate into exactly the curve that I want tomorrow, when I spring out of bed. So get it on Marvin Gaye. 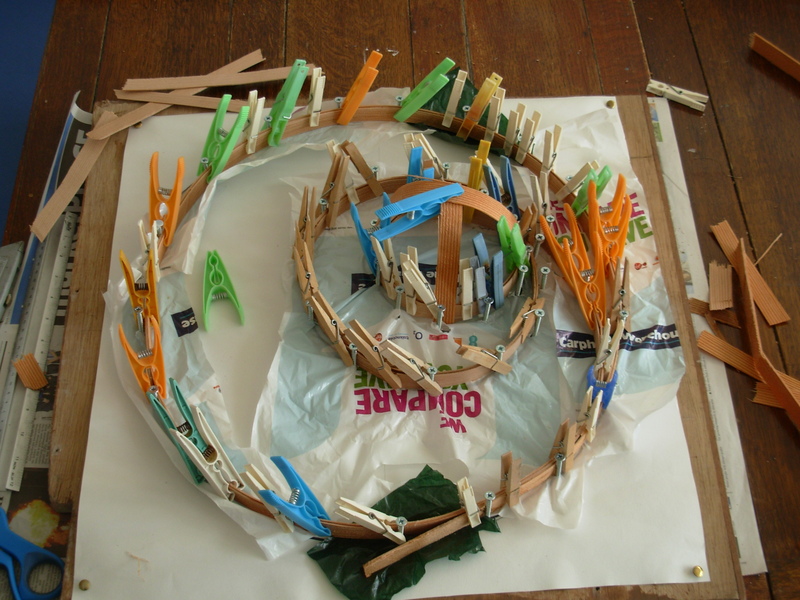 This entry was posted in sculpture project on October 30, 2015 by robjohnsey.